My friend bought this magnet as part of a set of local attractions in Buffalo. So prettily designed, I can't tell you. Can't wait to use them! 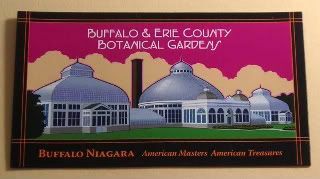 Though Mom has made sure we've visited many a botanical garden in our lifetime, I've not been to the Buffalo & Erie County Botanical Gardens. It has a great history, mostly because it was designed by the legendary landscape architect Frederick Law Olmsted. He's the guy most known for Central Park, but he's done so many parks and academic campuses around the US that it's impossible to have a complete list - and it's almost impossible that you haven't visited any number of his works. The gorgeous conservatory was built at the turn of the century (wow, I just realized that turn of the century totally needs to be qualified now - make that 1897-1899), and is one of the few Victorian-style conservatories left here in America. I can just see my mom running around from plant to plant, taking notes here and there. It's what she does - while we're wandering around the gardens, kicking the dirt, she walks around, like a little butterfly, poring closely over various plants and such. She was born for this stuff - I can just see her in Victorian dress, getting along famously with Professor Cowell, the guy who was in charge of the garden's inventory when it was first established - trading with other gardens to make sure he could get a wider variety of plants. So funny. Or, rather, it's terribly funny. In my head, anyway. Hahah. *Their tagline. Very sweet, I thought. And fitting. If you're my mom, anyway.